This blog is basically a succession of gripes and grumbles about the installation of the technological hardware necessary to get a model railway to work. Most of these gripes can be summed up as: "Why don't they manufacture the damned thing like that in the first place!!!" 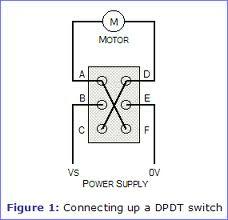 The latest example of this is the so-called DPDT switch - double-pole-double-throw. I do understand the function of this switch. However, I won't bore my reader with why that function is required - I want to save my energy for complaining instead. 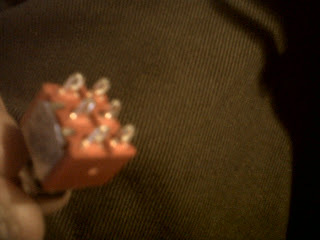 WHY, WHY, WHY do these switches not always come pre-wired in this way? As far as I can see whatever you are using the DPDT switch for, it must always have these cross wires soldered in position before you can do anything with it. So why don't the manufacturers pre-solder them? It would be like buying a car without a steering wheel? 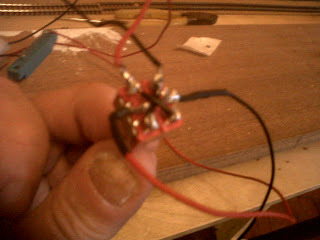 AND, it is the most fiddly soldering job to carry out - although, I managed it in the end. Entered into Google "pre-wired DPDT switches". Sure enough, there is a chap who has been soldering the little wires into position and offering them for sale. So, I ordered 5 pre-wired switches from him. Listening to Choral Evensong on Radio 3 from St Alban's Church, Holburn. The minister who led the service came up with a very nice phrase. He said that one of the functions of worship in the church was "to draw people to God through the beauty of holiness." It prompted me to wonder what the meaning of holiness actually is. I did a bit of research on the internet and one commentator observed that in the Bible, God is described as having many divine attributes but holiness is primary among them. That conveys its importance, but what about its meaning? One element of holiness is separateness: God is separate from man. I think I'll leave my ponderings at that for now.